In 1999 a young Australian actor named Hugh Jackman took London by storm playing Curly in a West End revival of the classic musical and lit the rocket he soon took to international stardom. The beloved Rodgers and Hammerstein musical forever changed this particularly American art form when it first debuted. In 1999 a young Australian actor named Hugh Jackman took London by storm playing Curly in a West End revival of the classic musical Oklahoma! , lighting the rocket he soon took to international stardom. Image Entertainment is delighted to be presenting this theatrical milestone for the first time ever on Blu-ray(TM) on December 4th at an SRP of $29.98. The beloved Rodgers and Hammerstein musical Oklahoma! forever changed this particularly American art form. Not only did it provide some of the greatest songs ever written, including Oklahoma!, Oh, What a Beautiful Mornin', People Will Say We're in Love, and The Surrey with the Fringe on Top, the musical numbers were written to move the story's narrative forward as well. And Agnes de Mille's breathtaking choreography was something Broadway theatregoers had never seen before. Jackman (X-Men, Australia), who will next be seen starring in the holiday blockbuster musical, Les Miserables, is one of the world's best known stars for his varied work in feature films, theatre and television. In the theatre world, Jackman received a Tony(TM) Award for his starring role in The Boy from Oz. He has hosted the venerable Tony(TM) Award shows numerous times, and "Hugh Jackman: Back on Broadway," his limited-run, one-man show last year was also a stunning, sold-out success. This year he received a Special Tony(TM) Award for his work as a performer and humanitarian. 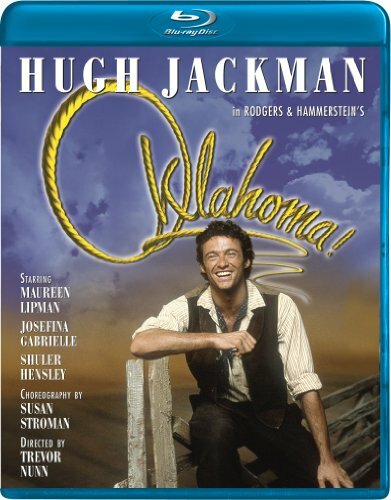 Bonus Feature: The Making of Oklahoma!